December 2nd through the 8th is National Influenza Vaccination Week. Established by the CDC in 2005, this week stresses the importance of getting your flu shot for peak season from December through February. The CDC reports that “among adults hospitalized with flu during the 2017-2018 influenza season, heart disease was among the most commonly-occurring chronic conditions; about half of adults hospitalized with flu during the 2017-2018 flu season had heart disease.” Dr. Brion Winston has a personal interest and medical background in public health. He shared his views on the importance of getting the flu shot this season. “The answer on when to get a flu shot is, early and often,” began Dr. Winston. “Earlier in the season to avoid the first outbreak and continue vaccination throughout your life.” Flu vaccines are developed based on the findings of the virus from the previous season. Recommendations are made for both the northern and southern hemisphere. The vaccinations are based on two main surface proteins that change and shift from year to year, and season to season. These proteins change and move gradually, allowing the research to develop the vaccines with a reasonably good prediction of effectiveness. Although not always perfect. The effectiveness of the vaccine can range from as low as 10%, which is uncommon and to greater than 50% effective in most years. There is also a benefit in getting the flu vaccine over your life. A first-time recipient does receive as much protection as someone who has had the previously received it. “This relates to immunological memory, which we have, that if you encounter the flu virus, your body will mount a better response,” stated Dr. Winston. It takes about two weeks after vaccination for antibodies that protect against flu to develop in the body. The CDC recommends getting your vaccine in October but getting your’s in January is still beneficial as the season is known to last through March. 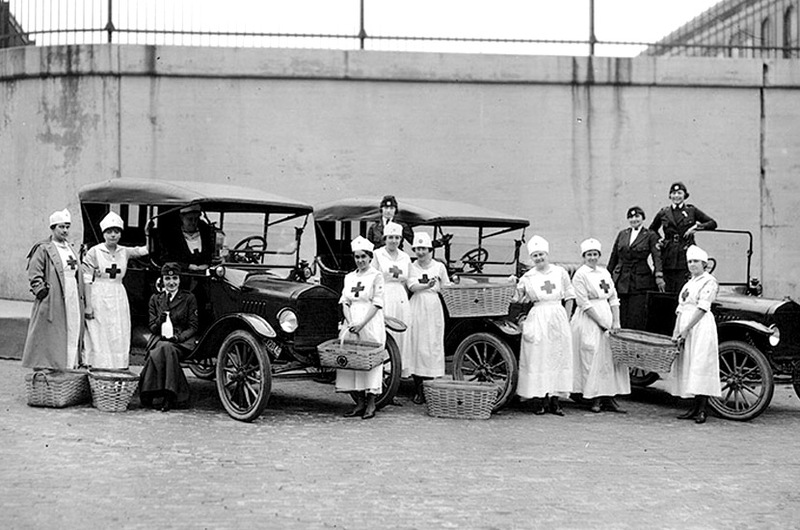 Motor Corps and Canteen volunteers from the Detroit chapter of the American Red Cross, taking a break from delivering supplies to flu victims. To prepare Detroit for what was to come from the pandemic, the Red Cross and Department of Health nurses cooperated together for home visits, food preparation, and childcare. Influenza starts as what is known as a zoonosis, it originates in animals, in pigs and poultry. The genetic make-up of the virus freely intermingles with the genome that is present in human influenza; this is the way that over the seasons the virus changes. When we go indoors and are in closer contact with each other during the winter, this is the perfect environment for the virus to spread. • Maintain a two week supply of your regular medications during flu season. • Do not stop taking your regular medications without first consulting your doctor, especially in the event that you get the flu or another respiratory infection. • People with heart failure should be alert to changes in their breathing and should promptly report changes to their doctor. • If you get sick with flu symptoms call your doctor right away. In America, vaccines are recommended for all people over six months of age. Even with warnings, education, and the thought of caring for a child with the flu for two weeks, the C.S. Mott Children’s Hospital reported that 34% percent of US parents said their child was unlikely to get the flu vaccine this year. Some of the reasons given in the online poll were that they were concerned about side effects, that the vaccine doesn’t work very well and that their currently healthy child does not need to be vaccinated.